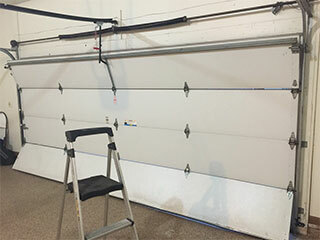 If you have been trying to save money by cutting back on seemingly unnecessary garage door maintenance, you may be interested to know that for each task you delay, you could be creating a bigger, more expensive problem in the future. A system that is always properly maintained will likely never need to undergo any serious and expensive repairs, so if you would like to save more money in the long run, consider staying on top of your system’s maintenance tasks. Opener repair is often only necessary when an obvious problem has been ignored for too long, although accidents and power surges can play their part as well. Either way, keeping a close eye on the condition of your door’s motor is essential for those who want to avoid the cost of repairs at a later stage. Should its operation not be smooth enough or if it's making too much noise, you should have it checked by a professional before the problem becomes a seriously expensive one. Ensure that the door itself is always adequately protected by the elements by giving it a protective coat of varnish or paint. This will help it combat the effects of harsh weather, whether it is damp or sunny. An unprotected door can quickly have its structural integrity compromised and will eventually have you needing to replace various door parts, at a far greater rate - and, consequently, cost - than what simple maintenance can offer. Maintenance on your system involves looking after a great number of smaller, unnoticed components. Trolleys, bearings, and tracks all have moving parts which will get worn down over time, and so they should be well lubricated on a regular basis. Your springs are responsible for balancing and supporting your system, and the pressure under which they operate can take its toll over time. In order to avoid the need for untimely repairs, it is essential that you routinely examine your garage door springs and get them replaced whenever they show signs of trouble. The dangers you'll avoid will be well worth the costs. You can actually save money in the long run by having your garage door system undergo routine maintenance by trained professionals. As the old saying goes, a stitch in time saves nine, so contact our experts at Garage Door Repair Miami today and schedule an appointment. Our friendly and reliable technicians should be your choice for dependable garage door repairs, service and installations. We guarantee your complete satisfaction, whether you need an opener replacement or repair, spring replacement, or any other service, our team is the one to call. Contact us for any garage door service, maintenance or new door installation. You’ll be glad you did! Our technician will contact you before arriving. Until then, feel free to browse our website! Garage Door Repair Miami is at your service!